> from the quarries to install inside of it (them). I’m not sure how you gleaned all that information from the translation. There are no explicit statements about seeing or building any pyramid or even acknowledging that any pyramid was man made. He mentions relatively small accessory parts. I had mentioned that my concern is whether there are any firsthand eyewitness reports of pyramids in the 3rd millennium BC, especially of any major stone pyramid under contemporaneous construction. I'm not as concerned about what Weni claims or implies that anyone else might have done or seen as much as I'm concerned about what Weni, himself, claims he did and saw (and that’s assuming that this tomb inscription really is autobiographical). In that regard, while Weni might have known the king’s (presumably stone) pyramid was man made, he doesn’t state that. Likewise, nothing in the inscription indicates that Weni saw a stone pyramid under construction, or even one that was already built. He simply states that he was ordered to procure/deliver stone accessories for a pyramid without stating any other details about the size or composition of that pyramid or the size of the accessories he procured, or how those accessories were manufactured. By the way, among the stone objects he was ordered to procure, he only mentions a single (not plural) sarcophagus, pyramidion, and false-door. So Egyptian queens received pyramids too: they ranked close enough to their husbands to deserve a lot of resources being put into their burial. One should not, however, claim anything like complete equality. After all, Uni did not work for the queen — it was Pharaoh who ordered him to act — and the pyramid was named after her husband. More basically, another thing Pharaoh’s government did is furnish burial materials — like a sarcophagus — for members of the royal family. > LC granite quarry Walmart. Interesting that you would characterize it that way since the inscription actually translates to Weni only “bringing” those things and not actually quarrying them or manufacturing them (with the possible exception of one offering table, see below). Weni characterizes the pyramidion as “costly”, but he doesn’t describe how much work was required to make it. I wonder why? Weni brags about how much the king appreciated him for making his travel comfortable. He brags about many things that pleased the king and mentions much of the work he had to do, such as constructing boats and digging canals. So why not make a big deal about doing all that stone work. At least let us know it was hard work, and maybe tell us how long it took to do it (he does mention the time to complete a few other jobs).Considering how hard that stone is, I would think Weni would have done well to brag early and often, and include any praise he got from the King for that, rather than focus merely on the cost of a single "expensive" item. Would the king not be equally impressed by all the difficult stonework Weni apparently accomplished to the point of further expressing his praise and love to him for serving the queen's pyramids in such an important way? > may not have built"? He does refer to one offering table that was “quarried” in Hatnub but he doesn’t say he had it quarried (i.e., the way he took credit for other construction tasks) but rather simply refers to "it having been quarried", and he doesn’t refer to how any other of his procured stone objects originated (or when). And so we can only “imagine”. He simply says he was ordered by “his majesty” to “bring” them, and he delivered. > A fairy tale? A children's story? Well, it is an inscription in a tomb, after all, with all the implications implied by the funerary context, including provisions, skills, and credentials for entry to the afterlife, and we’ve already seen how fairy tale-ish other tomb inscriptions can be (cf. Rekhmire, Djehutihotep, Unas Causeway). So I, for one, am not writing off that distinct possibility. Why would you?. For example, it’s intriguing how often he declares how much love and praise the king expressed for him, making sure we fully appreciate how far a slave had progressed in the ranks. I sense a defensive tone that suggests he was trying to make a strong impression, e.g., to earn his ticket to ride into the afterlife. Keep in mind that he claims he was able to hew the “hard stone” offering-table in Hatnub, shape it, transport it to a river boat, transport it down the river, transport it from the river boat, and make the final delivery all in "17 days". He also claims it took only "17 days" to construct a cargo boat of acacia wood that was 60 cubits in length and 30 cubits in breadth (the only length metric he states in the entire inscription). If that cubit is anywhere near the size of Petrie’s cubit, that’s a 100’ x 50’ barge. In "17 days"? It’s not that easy (at least for me) to accept these things as facts pertaining to the physical world. By the way, how large is “very large”, and how many constitute “laden”? Especially if the boat was a 100' x 50' acacia barge that was built in only 17 days. > general, the AE need to be given their due. “…their due” is in the eye of the believer. From my perspective, the AE are not “entitled” to any credit. Anything "due" to them must be earned. 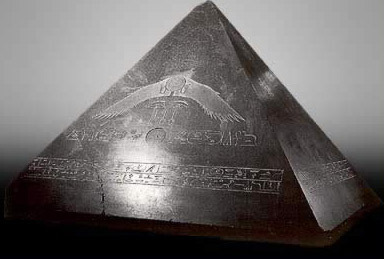 Weni was ordered by the king to procure accessory parts for the queen’s pyramid. There is no mention of the size, construction, date of origin, or composition of any pyramid. There is no mention of Weni actually seeing any major stone pyramid. There is no mention of Weni observing the construction of any major stone pyramid. There is no mention of any major stone pyramid being man made. Edited 3 time(s). Last edit at 04-Mar-17 13:38 by Origyptian.